Childress looks into the mysterious disappearance of Michael Rockefeller, a young anthropologist from Harvard who may have been killed by headhunters in New Guinea in November of 1961. Bolm takes us to the strange world of the Andaman Islands and the uncontacted tribes who live there. Childress looks at the Unfinished Obelisk at the granite quarries of Aswan in southern Egypt and the awesome undertaking to quarry and move stones in ancient times. Have a look at the mysterious geological feature in the Sahara Desert known as the Eye of Africa or the Eye of the Sahara. Some say that this might have been the site of the legendary lost city of Atlantis. Plus News Round-Up, Crypto Corner, Prof. Wexler, WEX Remembers and more! Picture this; you’re on the way home, from an ordinary day at work, or an uneventful day off, where you may have simply run some errands and done some chores. You are not expecting anything from Amazon, and no one owes you money, so there won’t be any checks in the mailbox. You arrive at your home, and the postal delivery person for your neighborhood has left a small box on your doorstep. You wonder Who in the world could that be from? As you pick it up, you see the return address is Kempton, Illinois. Then it occurs to you that you’ve just received yet another surprise from David Hatcher Childress, founder of Adventures Unlimited Press and The World Explorers Club as well as World Explorer, a magazine that always puts a smile on your face! When you get inside, no matter your age, you suddenly feel like a kid on Christmas morning, and you quickly get settled so that you can sit comfortably and open the parcel. Inside my last package was a great book David wrote entitled Vimana: Flying Machines of the Ancients. There was also another great surprise, the third issue of World Explorer (Vol 1, No 3) from 1993. This 3rd issue of the magazine is a collector’s item, which you can buy on the back issues page of current issues, or on the website... it sells for twenty bucks. There were also some stickers, a very cool (no pun intended), insulated travel mug with the World Explorer Logo on it, a catalog of the latest book offerings, an itinerary of the upcoming trip or two, and I think there was a DVD. Maybe I am remembering a DVD along with my last issue of World Explorer. Now the question on your mind should be, why is he getting all this great stuff? It’s simple! I am a proud Lifetime Member in The World Explorers Club. It was the best money I ever spent, and I am an old man. Father Time may be a nom de plume, but I have been around long enough to see a great ￼many things! I only wish that I knew about World Explorer when David Hatcher Childress published the first issue back in 1991. The first two issues are no longer available in print form, but maybe I will one day convince David to have his printer make replica copies of those first two issues. I am sure there are thousands of fans who would love to own them. 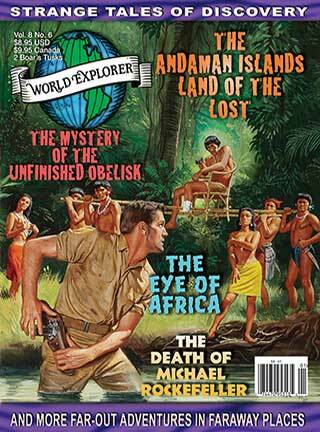 I was fortunate enough to find and purchase a copy of World Explorer Far Out Adventures - The Best Of World Explorer Magazine, which was published in a large softcover format, back in 2001. This delightful volume of over 500 pages contains reprints of most of the pages of the first 9 issues of the magazine, so I have volume 1, numbers 1 & 2, in that wonderful compilation. Can you tell I am a big fan? I also own all the DVDs of Ancient Aliens, a fabulous show that David is heavily involved in, as well. Now, back to the Lifetime Member story. On the inside back page of every issue, there is an order form where people can order a one year membership, a contributing membership, a supporting membership, or if you have the guts and the gumption (and a cool grand) a Lifetime Membership! When you join as a lifetimer, you immediately get so many gifts and goodies, that when you do the math, you practically get about 300 bucks in merchandise! Then once or twice a year, David has the staff send out packages to the lifetime members. That was the box I described earlier. Like I said, it was the best money I ever spent. It’s also delightful to sometimes receive a regular issue of World Explorer with a DVD tucked inside. It might be a Retro Drive-In Double Feature (my favorite was the disc with Flight To Mars 1951 and Phantom Planet 1961) or it might be one of David’s pre-Ancient Aliens DVDs such as Ancient Technology In Nazca & Central Peru. The bottom line is this, David does not need your thousand bucks, he’s successfully published dozen of titles, he’s traveled the world several times ￼over, as a modern-day, real-life Indiana Jones, and he’s been publishing books and magazines for decades. However, when you cough up the fee to join as a lifetime member, it shows that you’re seriously interested in his work, his writings, his travels, and his publishing businesses! Then he can turn around and reward you with many hours of fine reading enjoyment, not to mention the amusing movies along with the old-time television commercials included on the discs. The Volume 1, Number 3 issue of World Explorer, which has the look and feel of an aged manuscript, is fascinating, because it allows you to see an article that Mr. Childress wrote, way back in 1993, about the Egyptian tomb in Arizona, somewhere in the Grand Canyon, which was excavated by The Smithsonian, only to have them later deny the whole incident. This Smithsonian Cover-Up was recently featured in one of the episodes of Ancient Aliens, probably because of David’s input, and he’s known about this scandal for over 20 years. How amazing is that? If it sounds like I am giving you a sales pitch about joining WEX as a lifetime member, I am not, I am simply excited about all of these fascinating subjects, I love the Ancient Aliens programs, I love David’s books, and the World Explorer gives me something to look forward to. I especially look forward to those packages of surprises coming in the mail from Kempton, Illinois. The description on the inside back cover of the magazine is vague when mentioning the lifetime membership; “It’s the whole Kit and Kaboodle and much much more. And, it lasts forever. Write in for full details.” I didn’t bother to write, I took a leap of faith, and I am glad that I did! I especially love the World Explorers Club wall clock that I have hanging above my desk, and the WEX wristwatch was pretty cool, although I had to buy a larger leather wristband on Amazon, to accommodate my large wrist. No worries. I am not going to list every little thing I’ve received as a lifetime member, so that some of you, when you join, can be pleasantly surprised! Even the classifieds in the back of World Explorer are fun to read... some are silly, some are strange, and some are, well, I got a kick out of the fellow who was looking to sell his “SA-989 Series Polywarp Time Machine for only 34 troy ounces of gold in coin or ingot form.” He said it “conforms to the 2022 Time Travel Device Registration Act” and that was back in Volume 5, Number 7, from 2010. I am confident that there are many people, and a few extraterrestrials, out there, who will enjoy a membership in the World Explorers Club, whether they join as a Regular, Contributing, or Supporting Member, or especially if they take the leap, as I did, and grab the Lifetime Membership. I can’t be sure, but I have a feeling that some of those Nazca Lines are also encouraging the people of the Earth, today, to join WEX Club! Just ask Professor Wexler! Father Time is a writer of self-help materials, writes for others as a ghost, is a native Floridian and a Lifetime Member of World Explorers Club!